To go along with the campaign we have created a series of Daily Prayer Videos, so stop in here and check out the verse of the day and few thoughts to get you thinking. Also watch for these videos on Facebook! 40 Days of Prayer: Unleash the Power! Join us in our Churchwide Campaign from Feb 9-Mar 22, 2019, as we spend 6 weeks learning together how to cultivate a powerful prayer life! For the 6 weeks of the campaign our entire church — children, youth, adults — will be learning about prayer, both in our weekly services as well as in small groups and home activities. You won’t want to miss out! 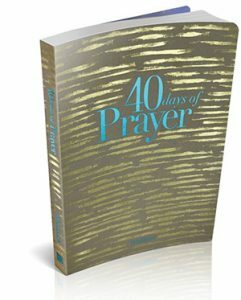 40 Days of Prayer Workbooks will be available from your group leader for $10 each. The workbook contains the study guide for each small group lesson, daily prayer prompts, space for weekly sermon notes, and suggestions for further study.